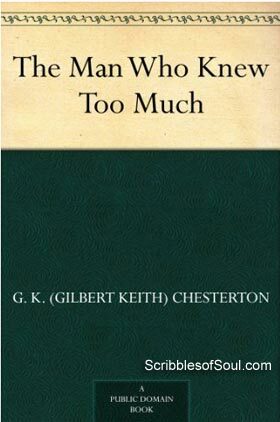 The Man who Knew Too Much by G.K. Chesterton is a novel I recently picked up or rather downloaded through my Kindle App quite impulsively. When I began reading, I knew nothing about the book or the author. And, my decision was totally based on the appeal of the intriguing title. However, as I finished it, I am really glad that I followed my heart. As this book is one of those rare gems, that lay scattered in the deep sea of literature, well known in their times, but conveniently forgotten, hidden beneath the vast works of a prolific writer. 80 books, hundreds of poems, 4000 essays and some 200 short stories. His works covered various fields of politics, philosophy and religion. And, his one stand out feature was the Detective Short Stories, featuring the famed Father Brown. However, the book under review is one of the lesser known treasures closeted in the chest of G. K. Chesterton. The Man who Knew Too Much is a precursor of Father Brown, and an amateurish attempt at detective fiction, with Horne Fisher, playing the role of sleuth. As the book began, Horne Fisher was shown fishing on the bank of a river, where Harold March – a political journalist, marched onto meet a celebrated statesman. To tell you the truth, I was won over by the introductory puns themselves, even before the actual story began. As Fisher and March exchange greetings, they become witness to a bizarre accident. A car topples over the cliff edge and falls next to the river bank. Both the men are shocked and the unusual incident strengthens their familiarity. The ill fated accident was described in simplest words, yet the unusual setting and introduction, made me realize that it will play a major role. Horne Fisher, who was till now behaving as a sleepy, slightly eccentric scientific philosopher instantly transformed into an energetic, shrewd detective. In his haphazard way, he tries to solve the mystery behind the apparent car incident, suspected by some as a suicide, which finally turns out to be a murder, thanks to some mind boggling games played by Horne Fisher! I quite liked the first story. It set the tone of the novel and soared my expectations sky high. But, till now, I did not know, that the book is not a structured novel, but rather a compilation of short stories, which can be read as individual pieces. So, during the first half of the second story ‘The Vanishing Prince’ I spent quite a lot of time, trying to establish relations between the first few pages and the dramatic incidents that were unfolding now. And, thanks to my ignorance, I was left a bit harried for the major part. The story had nothing to do with the perpetrator of the first crime and focused on a smart criminal Michael. By this time, I was seriously wondering something is wrong with my interpretation of the story. However, as Fisher made an entry almost at the middle and became witness to another bizarre incident, I finally realized my folly. The book is a short story collection, and each piece is individually complete, supposed to be savored and forgotten before the next one is read. My experience with the second one, prepared me better for the coming ones. Though, I found the third one quite dull. ‘The Soul of a Schoolboy’ is about a clergyman and his nephew, centered around an antique, featuring a magician closeted in a deserted museum. The setting was novel, the premise promising and I had also understood Chesterton’s intent of confusing the reader. Thus, I continued reading at a slow pace and was at ease with writer’s roundabout approach. But, unluckily, the story did not hold itself well. I found it the least intriguing. The end is loose in almost all the stories, but in the third one, even the explanations were half baked and hurried. However, my expectations were ripe after the first two stories and barring the third one, rest of the stories were quite entertaining. Over time, I actually began to enjoy the detached, brooding soliloquies of Horne Fisher. Whenever he spoke, his intelligent reasoning was greeted with a stunned silence. His audience were always struck dumb with his precise logic and wide reaching knowledge of hidden secrets. Add to this, Chesterton’s situational comedy, sarcastic comments and literary puns, and I was simply bowled over. The stories are not too great content wise, but the narration and unusual logical expostulations by the protagonist made me enjoy ‘Man who Knew too Much’ quite a lot. In a nutshell, all the stories are based upon a crime, be it a murder, theft or treachery. Horne Fisher is inevitably present on the crime scene by a coincidence. He is privy to some unknown policies or reasons behind the incident and at the opportune time voices his opinion, and is able to expose the perpetrator. But, as most of the crimes were either politically motivated or committed by prominent political figure or the victim himself is so notorious that the crime seems innocent, none of the criminals are brought to book. And, this is one aspect of The Man Who Knew Too Much that seriously pricked my conscience. However, as I approached towards the end, I could see a smirking satire engulfed in the easy manner of G. K. Chesterton. He, in his inimitable way, proved that anything is possible for those who have money and power. And, Horne Fisher, despite his connections and relations, remains unsuccessful in his endeavors and notwithstanding his immense potential, strikes as a lonely crusader, who can rant but not deliver. As an anti thesis to Fisher, the suave Harold March stands out as a honest journalist who is unable to understand the charade of decency. He tries hard to expose the criminal, but is powerless in front of lucid explanations offered by Horne Fisher. As I said earlier, the stories are not at all connected but they do have a common thread. The characters repeat and over time, establish a rapport with the reader. In a way, entire life of Horne Fisher is covered over the span of these eight stories. Chesterton could have expanded Fisher series, as here we do have an unusual hero, gifted with great wit and sound logic. But, perhaps the writer was so successful with Father Brown, that he need not depend upon Fisher anymore, and thus the promising sleuth remained limited to these stories only. Nevertheless, this short book of just 126 pages has ignited my passion for thrillers and mysteries. The curiosity that began with Agatha Christie’s Secret Adversary, has scaled new heights with Chesterton’s The Man who Knew Too Much and I am more than ready for classic detective fiction of Hercules Poirot, Father Brown and Sherlock Holmes. Quite enjoyed the eBook while it lasted. The stories may not be super exciting, but their easy charm did impress me. A good old fashioned time pass.